This page has old news items. Click here to go back to our main news page. Nick Turland, co-author of the excellent reference book, ‘Flowers of Crete’, has kindly agreed to give a slideshow and talk entitled ‘The Endangered Wild Flowers of Crete’ to supporters of ‘Flowers of Crete’ and the community in general. The talk will take place at BioAroma, Ammouda Xirokambos, Aghios Nikolaos at 7.30 p.m. on Saturday, 21st March, 2009. Entrance will be free, but voluntary donations to The Flowers of Crete Sylogos are requested. Numbers will be limited by space, so anyone who would like to attend, is asked to contact Julia Jones at julia@flowersofcrete.info to obtain their ticket. This event is expected to be very popular, so please register your interest as soon as possible. We hope to have a number of Nick and John’s comprehensive work available for signing. The approximate cost of the book is around 55 euros (depending on exchange rate). Anyone who would like to obtain a copy to let Julia know in good time, so that we can order sufficient copies. BioAroma is a distillery of organic Cretan herbs and is establishing, amongst other things, a small botanic garden of endemic species. The owner is producing essential oils, herbs, cosmetics and soaps from traditional Cretan herbs and Nick’s talk will be given in the small, but fascinating Museum of Cretan life on the ground floor of the factory. The evening should prove to be most informative and enjoyable. Julia (added 14 Dec 08). Last year Julia found a colony of Bellevalia that has been identified as B. trifoliata. This plant has never been identified in Eastern Crete before. It is recorded as doubtful in the Cretan area. Please look out for this plant and if you should find it, please send photos to Julia with details of its location. The name refers to the number of leaves – three leaves. 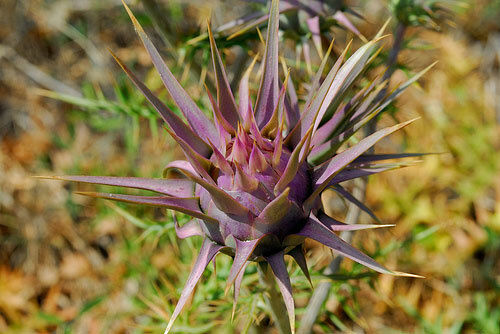 Julia found this species in flower above Elounda in March. Seeds have been sent to the Winter Gardens in Sunderland, but have not yet germinated (added 24 Nov 08). Nick Turland, co-author of Flowers of Crete, is conducting a survey of the distribution of Cynara cyrenaica, the Wild Artichoke. Again, should you find this plant next year, please photograph it and send Julia details of its location. This photo has been provided by Nick, but further information can be found in Flowers of Crete. The flowers are lilac-pink (added 24 Nov 08). Many thanks to Johannes Flohe for checking and adding to the German flower names that are now included in the calendar. His help is much appreciated (added 24 Nov 08). Sponsorship is now coming in to support Flowers of Crete and the forming of our Syllogos. We will be calling a Meeting for a discussion on the way forward in at La Casa Restaurant by the Lake in Aghios Nikolaos on Saturday, 15th November. We hope that many people will attend and that we will develop a positive programme for the winter period (added 24 Nov 08). Chris Woolfenden from Limnes has kindly taken on the role of Secretary and we would like to thank her for her support (added 24 Nov 08). General News: Please click here for the latest general news article for Flowers of Crete (added 10 Nov 08). 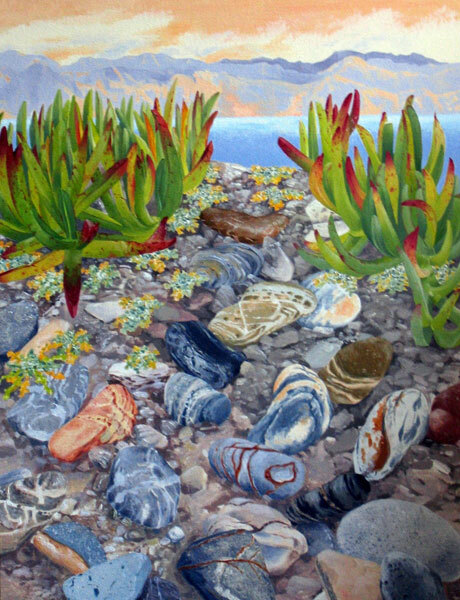 Flowers of Crete is delighted to be able to include the work of Jan Liodaki in its Flower Calendar from July onwards. Jan was born in England. She studied Fine Art at High Wycombe College of Art and Cardiff College of Art. In 1975 she moved permanently to Crete. She has exhibited three times in Athens with the support of the British Council. Since then she has exhibited very successfully in Hania, Rethymnon, Elounda, Aghios Nikolaos and in England. She has also taken part in many group shows in Greece. Two of her paintings were accepted by the Royal Academy in London. Her work is inspired by the great diversity of the Cretan countryside. For 2008, we are launching a scheme of participation between developers, estate agents and Flowers of Crete. In order to qualify for accreditation, developers and estate agents undertake by written agreement with The Committee of Flowers of Crete that they will allow any land for development be checked for rare and endangered flowers, orchids, etc. before building begins. In this way we can work together to promote conservation and preservation on the island. 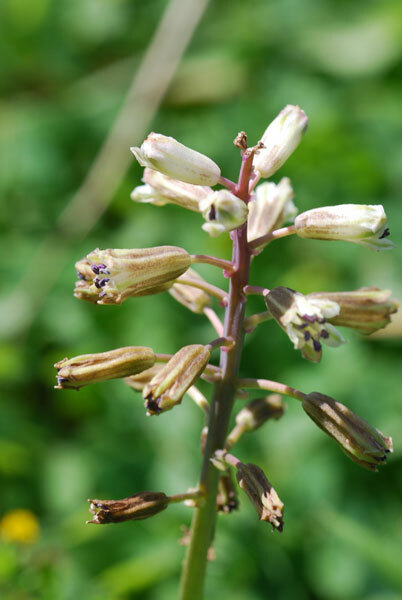 Any plants and flowers found will recorded and either be moved into an area of the garden around the development as a ‘reserve’ or moved to a safe site in the locality. A charge is made for this service dependent on the size of the land and the amount of work involved in setting up a wild life area within the plot. Information can be made available to prospective purchasers informing them of the ‘green’ issues involved in building in Crete and the eco-solution offered by our organisation. Anyone interested in being considered for this scheme, which will include a link on our site and a recommendation in our news section, please contact Julia Jones at julia@flowersofcrete.info. The cost of an accredited link to the Flowers of Crete website will cost 50 euros per year. Accredited agents will be licensed to display the Flowers of Crete Preservation logo on their promotional literature. A Zylogos (not-for-profit) organisation is being set up for Flowers of Crete, but, in order to comply with the regulations governing this, I have to provide at least 24 people who will offer their support by putting their names forward as founder members and will contribute a minimum of 50 euros ( GBP 35.00 / USD 70.00 ) towards legal costs. The forming of a Zylogos will benefit Flowers of Crete in many ways and offer a greater standing to the work we are doing here. A list of founding members will be available for anyone who wishes to inspect it, once we have obtained our Zylogos Tax number and documentation. I'd like to offer belated and very overdue thanks to my friend Sylvia Leigh for her contribution of a logo for Flowers of Crete. The logo represents Crocus oreocreticus - a very beautiful, endemic and endangered Crocus which grows close by on the Katharo Plateau. 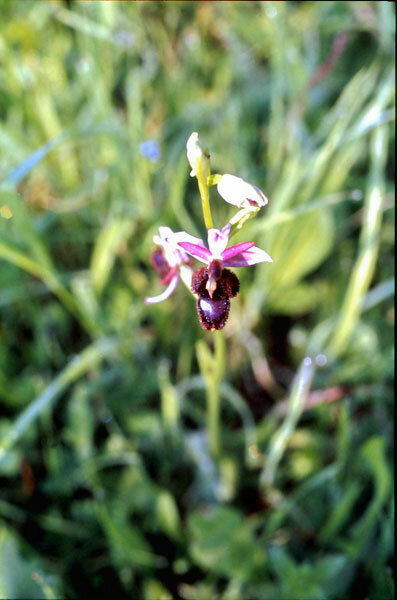 I am very grateful to Diana Pomonis for permission to include the images of orchids and other flowers taken by Neville Wykes on Crete during the 1980s. Included amongst these is a great photograph of Ophrys speculum - mirror ophrys - which has not been recorded on the island in recent years. Also the wonderful rare and endangered Himantoglossum sameriensis. I have yet to photograph this elusive endemic. Scans of Neville’s colour transparencies will be included in the relevant calendar months. 5th Planta Europa Conference, Romania - Julia was invited to speak at this conference, kindly sponsored by Crete Complete Property. Click here to read her brief report on the conference.